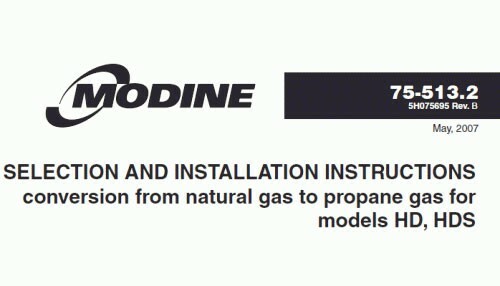 Conversion kit to convert models HD and HDS in sizes 30, 45, 60 or 75 to propane, or to natural gas. Choose the desired kit. Conversion kit to convert models HD and HDS in sizes 30, 45, 60 or 75 to propane, or to natural gas. Choose desired kit. Works with spark ignition and hot surface ignition units. Includes valve spring for both Honeywell and White Rogers valves.